The Bundesliga Club confirmed the deal on their official website on transfer deadline day. According to the football transfer rumours the fee in the region of 15 million euros was agreed between Bayer 04 and KRC Genk. “Bayer 04 Leverkusen have signed the Jamaican striker Leon Bailey with immediate effect. The 19-year-old joins the club from Belgian Europa League participants KRC Genk on a five-year contract to 2022.” said in the statement on the official website of Bayer 04. “In Leon Bailey we have brought in another highly promising player on a long-term deal, this lad was also high up on the wish list of many other European clubs. That makes as even happier to have won out against such strong competition.” declared Bayer 04 CEO Michael Schade. “Bayer 04 are a good club. I’d like to take my next important step here. Leverkusen are well known as a club where you can really develop. And the way they play football is attractive. 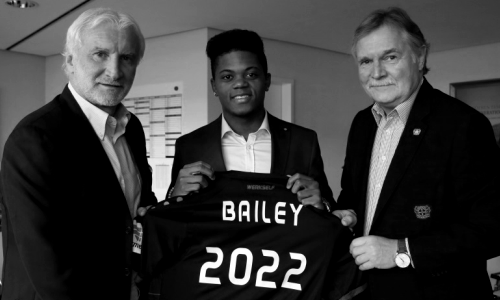 I like that,” said Leon Bailey who will wear the number nine shirt this season.